Enter these Larabar knock-offs from my friend Shelby. These homemade protein bars hit all the marks. They are delicious. They are filled with real good, healthy but tasty ingredients. They give me an opportunity to get back in the kitchen, but don’t take more than two dishes and eight minutes to make. Sold! Here is the recipe and some comments from Shelby. Some of my friends and I agreed to take a real food challenge for 100 days. Meals are relatively easy, but we have been in the hunt for real food snack items. 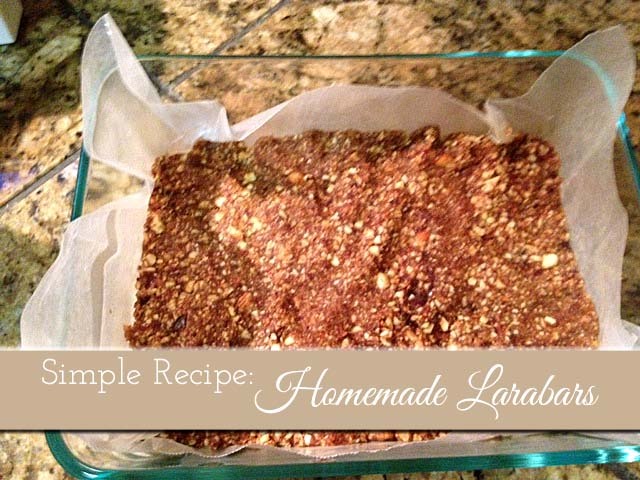 Larabars fit the bill – recognizable ingredients, a variety of flavors (I avoided the flavors with brown rice syrup and chocolate chips), and are non-GMO. I was sold. However, Larabars can get pricey – $1.19 is the lowest price I have found. And, even though they are non-GMO, Larabar is owned by General Mills, who supports the use of GMOs. Unfortunately, every dollar that I spend on Larabar supports General Mills. 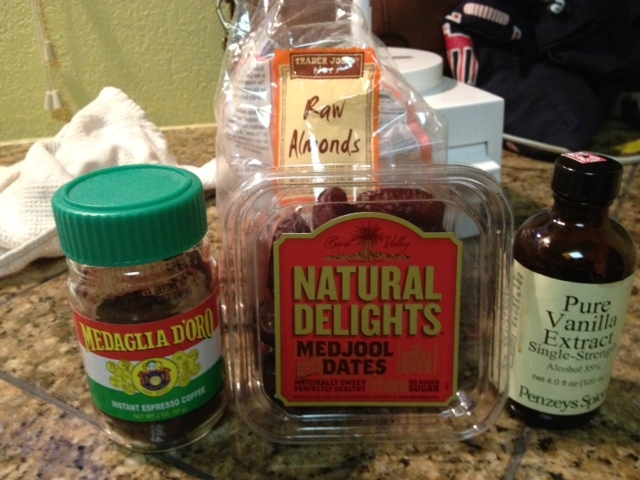 If you are looking to save a little money and have peaceful sleep free of GMO nightmares, try making your own homemade protein bars! There are a lot of copycat Larabar recipes floating around Pinterest, so I scoured many recipes and came up with a general formula for the bars. My first batch was a cappuccino flavor bar. They were easy to make and called for minimal ingredients that I already had on hand. I estimate the cost of this batch to be around $5 and depending on how big you cut the bars, you can get 8-12 pieces – a huge savings over store-bought Larabars. Add all ingredients to food processor bowl. Start out with 1 tsp of water and increase if necessary to make the bar “batter” easier to work with. Process the mixture until everything is incorporated. Scrape down sides of bowl if needed. Line a small pan (my pan was 6×8, but 8×8 would work too) with wax paper and press the mixture into the pan. Chill in fridge. Cut bars into desired size or cut as you consume. Store in the fridge. I’ve tried Shelby’s version, which is really good even for this non-coffee lover! Also, I’ve tried a cherry and almond version and (because I’m me…) a cashew and chocolate version. For the cherry and almond bar I used the same recipe as listed here, but added a splash of almond extract and substituted 1/3 cup of dried cherries for the dates. Don’t add the cherries in until the last few pulses so the pieces have a little heft left. For the cashew and chocolate version, substitute 1/2 cup peanut butter and 1/2 cup cashews for the almonds and cocoa powder for the espresso powder. Play around with liquids for consistency and cocoa powder to taste. I originally met Shelby through a Meet-Up group in Milwaukee – Cooking in the City. If you are looking to find other friends that love real food, then may I suggest attending one of this group’s events or bring your dudes to a Food Dudes and Divas get-together. Shelby really knows how to find the most unique experiences around town and who couldn’t use a couple new friends?